We all face the reality that friends and people we trusted betray us and walk out of our lives at times, but God is there for us in such times. This book shows how to trust God in times of betrayal by friends and is based on the Word of God. 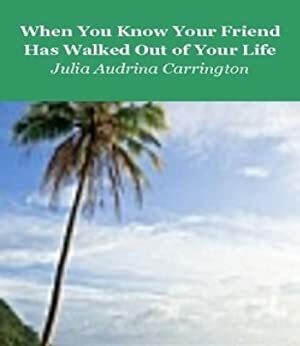 The author shares how her own friend betrayed her and walked out of her life, but also shares verses she claimed during this time and demonstrates her strong resolution to trust God no matter what. Get the book now! We started tracking this book on April 29, 2013. This book was $6.00 when we started tracking it. The price of this book has changed 103 times in the past 2,184 days. The lowest price to date was FREE last reached on November 22, 2018. This book has been FREE 51 times since we started tracking it. The highest price to date was $9.99 last reached on November 23, 2018. This book has been $9.99 49 times since we started tracking it.